Adventures in the Endless Pursuit of Entertainment: Mystery! You know I love a mystery. 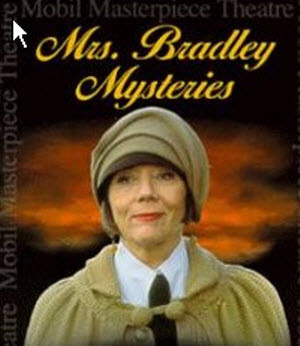 About 8 years ago, I discovered the Mrs. Bradley Mysteries, starring Dame Diana Rigg, on PBS. She's a 1920s sassy British divorcée with an eye for detail and logic. She loves Freud, men and cocktails, and can solve a murder just as well as a certain American. Last weekend I treated myself to the box set of the Mrs. Bradley Mysteries. I can't believe there were only five episodes. I guess I didn't care to notice when PBS repeated them over and over. I've now realized that these five wonderful episodes are based on the character Mrs. Bradley created by Gladys Mitchell, who wrote 80 mystery novels in her lifetime. I'm dying to read these now! The real mystery is that my New York Public Library only has TWO of her books in circulation. Out of eighty, that is a crime. So help me solve this travesty, and avoid ebay, by boxing up your collection and sending them to me straight away. Be aware that the books are pretty different from the shows. Mrs. Bradley is depicted almost as a malevolent crone sometimes, even if her cause is justice. I've never seen the series but I do love a good mystery, too - hard or soft boiled variety. I used to watch Dorothy Sayers' Lord Peter Whimsey mysteries. They were on PBS years ago. I haven't read any of them but I noticed in Borders today the Maisie Dobbs series by Jacqueline Winspear, which I think takes place during the 1930s.